Sleep is an absolute necessity for your good health and happiness. When you aren't getting the rest you need, your quality of life is dramatically reduced. If you've been struggling with a sleep disorder, you want answers so that you can feel good again. When you visit Sleep!, you will notice the difference immediately. We created a sleep center that not only provides accurate diagnosis for patients’ sleep disorders, but also treats patients with modern techniques, continuous positive air pressure (CPAP), oral appliances, and counseling services. Our professional team strives to make your experience a positive one. From luxury accommodations to streamlined care, we simply offer a better solution for people who suffer from sleep disorders. Patient care is our number one priority, so when you visit Sleep!, a technician will greet you immediately and get started on your appointment with no waiting. Each step of your diagnosis and treatment will come with a full explanation of what to expect. At Sleep!, we have a highly experienced, board certified sleep physician on staff. Dr. Beyene received training in other complementary medical areas such as neurology, otolaryngology, pulmonology, and psychiatry, as well. His experience and expertise ensures an accurate diagnosis and proper treatment of your sleep disorder. Our unique accommodations at Sleep! include a private bedroom with a security system for your safety and peace of mind. Our sleep study bedrooms look more like a luxury hotel room than a sleep clinic, complete with Sleep Number beds and a television. We created a space where you can relax and fall asleep naturally. Because we serve the business community, Patuxent River Naval Air Station, and working individuals, we created our sleep center with private bathrooms and a breakfast bar so that you can go straight from your overnight study to work the next morning. Our accommodations are not just for good looks. We provide a relaxing and convenient environment so that you can fall asleep and stay asleep, making our test results more valuable and creating as little disruption in your life as possible. Since 2006, oral appliance therapy has been an approved treatment for both mild and moderate obstructive sleep apnea (OSA). At Sleep!, our dentist Dr. Cooper works on site to treat your OSA using the latest technology in oral appliance therapy for sleep apnea. Oral appliance therapy is convenient, effective, and the first line of treatment in certain OSA cases. Our patients appreciate that they can have both diagnosis and treatment in the same location. Cleanliness, security, privacy, exceptional service, convenience, and affordability are the six pillars of success in the quality of care that we built our practice on. Call Us to Set Up Your Sleep Study Consultation - The Rest Is Up to You! When you discuss your concerns with your physician, they can provide you with a referral for a sleep study at Sleep!. Once you have your referral, call our California, MD sleep treatment center to set up your initial consultation, and our helpful team will guide you every step of the way toward a better night’s sleep and improved quality of life. Sleep! 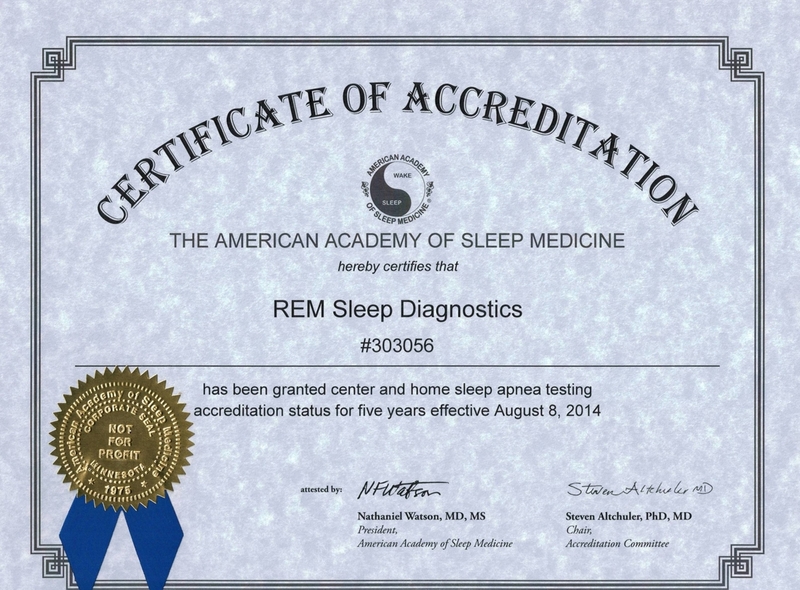 is the only sleep center in the county with a Certificate of Accreditation from The Academy of Sleep Medicine!